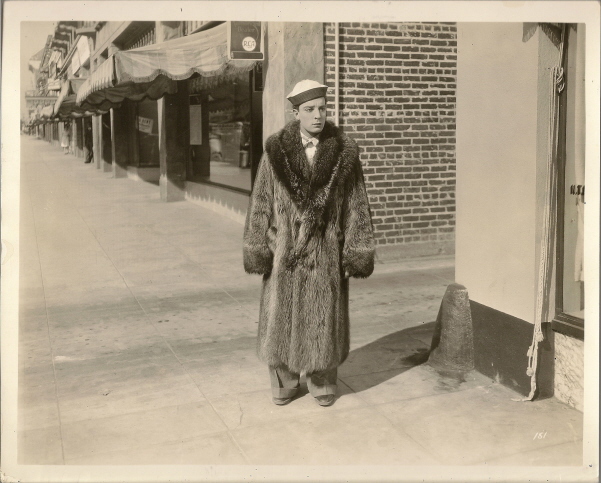 Larry Fine in Pop Goes the Easel (1935), Harold Lloyd and family in Hot Water (1924), and Harry Langdon in His Marriage Wow (1925), a panorama at 1st and Larchmont. The home at back still stands, see directly below. Poodles Hanneford in Better Behave (1928) at 1st and Gower. Developed along a street car line (always ripe for slapstick antics), Larchmont Boulevard has been a popular movie location for nearly 100 years. Harold Lloyd filmed there as early as 1917. During my luncheon talk at the Ebell Club on Monday, November 16, I will provide a multi-media tour of how the great silent comedians filmed their classic movies on the streets of Hollywood, focusing both on Larchmont where Buster Keaton, Harry Langdon, and even the Three Stooges once filmed, and Fremont Place, where Charlie Chaplin and others filmed just steps from the Ebell Club itself. Harry Langdon in Saturday Afternoon (1926) at 221 S. Larchmont. (C) Google. The “yellow car” Los Angeles Railway Line No. 3 ran from Melrose at Larchmont to downtown. Since Larchmont was quite wide, the trolley power line poles were perilously installed down the middle of the street, a tempting target for comedians. Above, Harry Langdon survives crashing sideways into one of these poles. Click to enlarge – Harold Lloyd and Snub Pollard in Lonesome Luke Messenger (1917). The Larchmont commercial block between Beverly and 1st was an attractive setting for early movies. Yet, as shown above, Harold Lloyd filmed long before commercial development began in 1921. 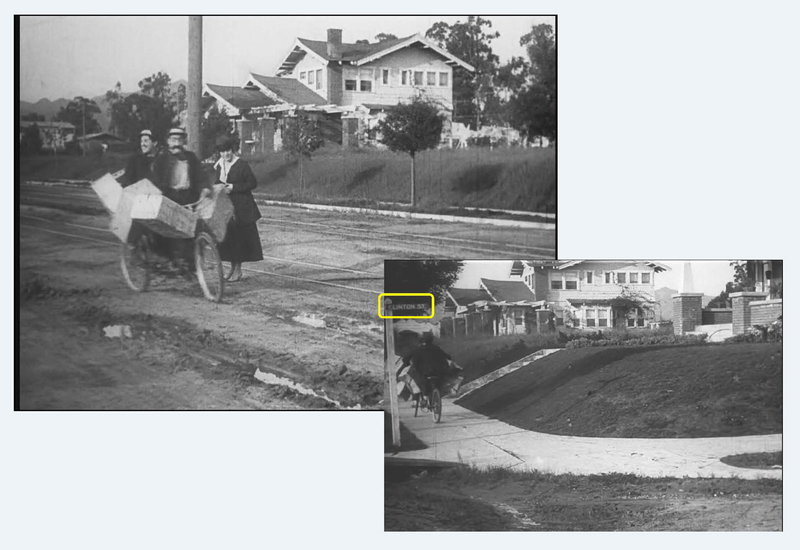 This scene from February or March of 1917 shows the homes at the NE corner of Clinton and Larchmont (see street sign), a block south of Melrose. The corner today is unrecognizable. From The Red Kimona (1925), looking east from the porch of 53 Fremont Place, still standing, towards the Aronson mansion at 31 Fremont Place, now lost, once adjacent to the Ebell. 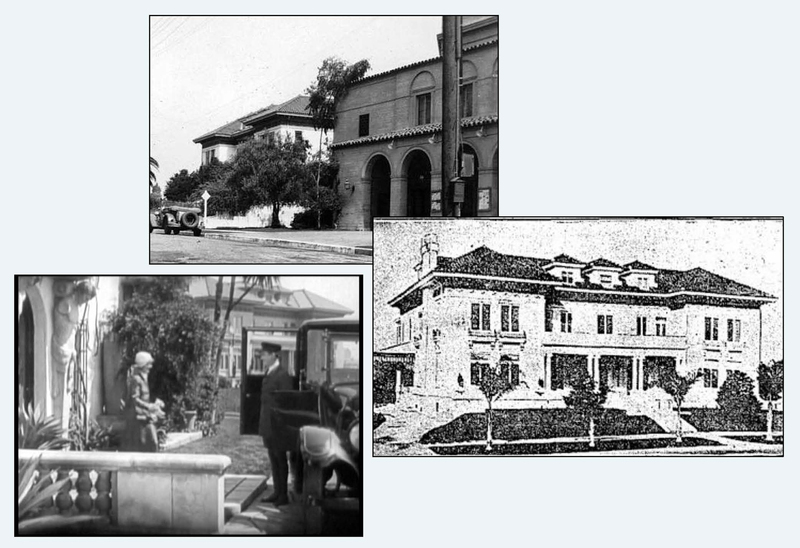 The upper image looks west along 8th Street from the Ebell towards the former Aronson home. Fremont Place blogspot. Above, one of several early movies filmed at Fremont Place, adjacent to the Ebell Club on Wilshire. Several grand mansions, now lost, are preserved in early cinema. Below, Harold returned to Larchmont nine years later to film For Heaven’s Sake on the main commercial block. Buster Keaton and Harry Langdon filmed here as well. 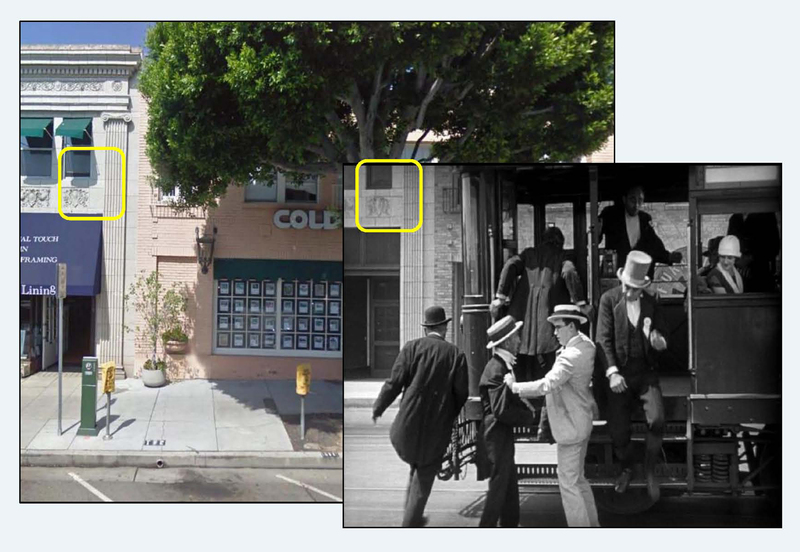 Harold herds a group of drunks onto a double-decker bus in For Heaven’s Sake (1926) at 113 N. Larchmont. If you live in the Los Angeles area, I hope you’ll consider attending my talk and book-signing at the Ebell of Los Angeles this coming Monday November 16. Ebell of Los Angeles: 743 South Lucerne Boulevard, Los Angeles 90005 323-931-1277. 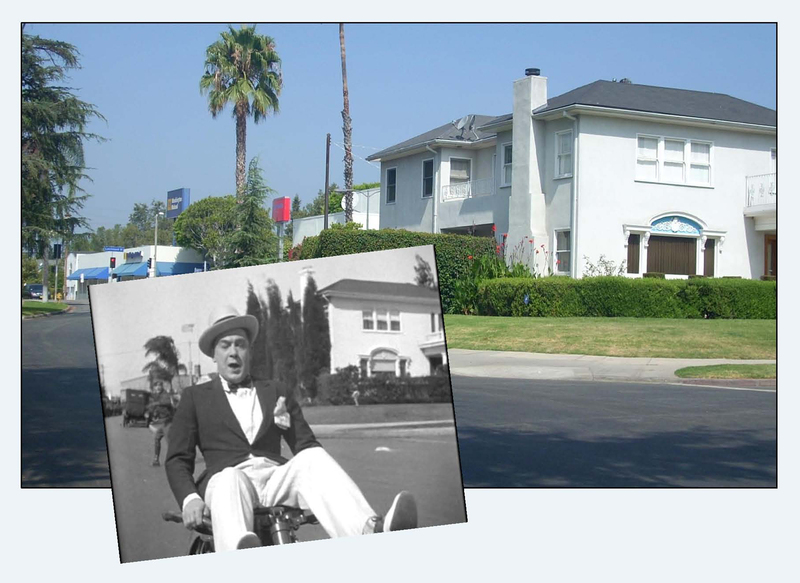 Bobby Cress’s Dear Old Hollywood Blogspot showing how Larchmont appeared in Bob Hope’s 1967 movie Eight on the Lam. This entry was posted in Harold Lloyd, Harry Langdon and tagged Buster Keaton, Charlie Chaplin, Ebell Club, Ebell of Los Angeles, For Heaven's Sake, Fremont Place, Harold Lloyd, Harry Langdon, His Marriage Wow, Hot Water, Larchmont, Larchmont Village, Poodles Hanneford, Saturday Afternoon, Silent Comedians, Silent Comedies, Silent Movie Locations, Silent Movies, The Red Kimona, then and now. Bookmark the permalink. All great, will print out and file. Thanks for more time travel excavation.